In this section you'll create an address class and learn how to create a template to display it. 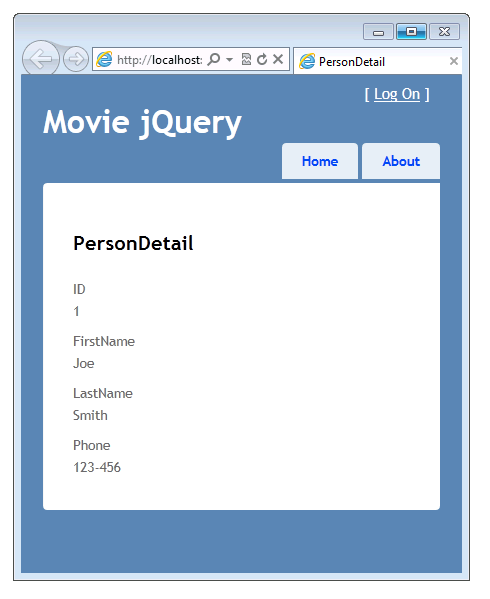 Open the Views\Movies\PersonDetail.cshtml file and add the following markup for the PersonDetail view. 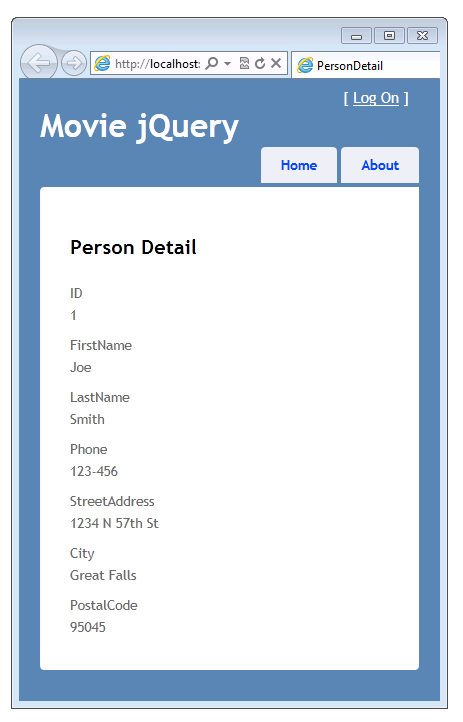 Press Ctrl+F5 to run the application and navigate to Movies/PersonDetail. The Address model data is not displayed because it's a complex type. To display the address information, open the Views\Movies\PersonDetail.cshtml file again and add the following markup. 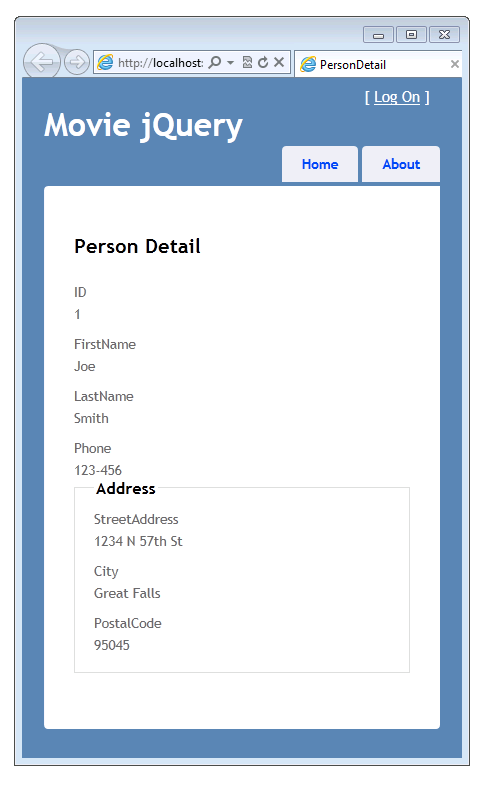 In this section you'll create a template that will be used to render the Address complex type. 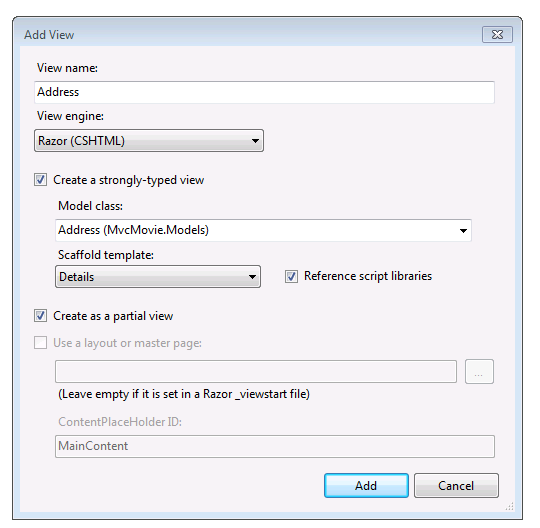 When you create a template for the Address type, ASP.NET MVC can automatically use it to format an address model anywhere in the application. This gives you a way to control the rendering of the Address type from just one place in the application. Applying a DataType attribute to a property in the model and specifying the data type. For example, the following code causes the date to be displayed without the time. If the application contains a date.cshtml template in the Views\Shared\DisplayTemplates folder or the Views\Movies\DisplayTemplates folder, that template will be used to render the DateTime property. Otherwise the built-in ASP.NET templating system displays the property as a date. Creating a display template in the Views\Shared\DisplayTemplates folder or the Views\Movies\DisplayTemplates folder whose name matches the data type that you want to format. For example, you saw that the Views\Shared\DisplayTemplates\DateTime.cshtml was used to render DateTime properties in a model, without adding an attribute to the model and without adding any markup to views. Using the UIHint attribute on the model to specify the template to display the model property. Explicitly adding the display template name to the Html.DisplayFor call in a view. The approach you use depends on what you need to do in your application. It's not uncommon to mix these approaches to get exactly the kind of formatting that you need. In the next section, you'll switch gears a bit and move from customizing how data is displayed to customizing how it's entered. You'll hook up the jQuery datepicker to the edit views in the application in order to provide a slick way to specify dates.